Chemical Reaction: The process of breaking old binding force of reactants and the formation of new binding force in theproduct is called chemical reaction. It is the process by which one or more substances are arranged to form different substances. Chemical Equation: The symbolic representation of actual chemical reaction in terms of words or molecular formula is called chemical equation. Reactants: Those chemicals which go under chemical change themselves during chemical reactions are called reactants. Products: Those chemicals which are formed as a result of chemical reaction are called products. In a chemical equation, reactants and products are separated by an arrow (→). Reactants are written in the left side of arrow and products are written on the right hand side of the arrow as in figure 3(a). 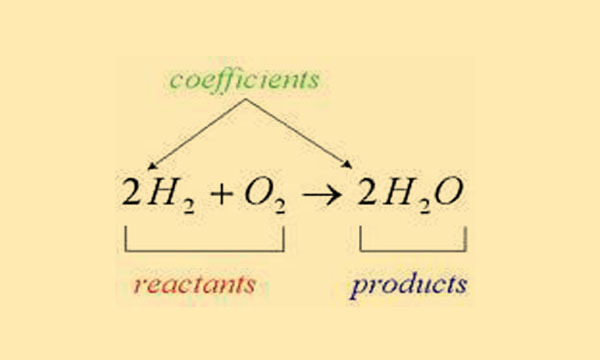 In the reversible reaction, reactants and products are separated by two way arrow ( ). The process of breaking old binding force and the formation of new binding force in product is called chemical reaction. Those chemicals which go under chemical change themselves during chemical reactions are called reactants. Those chemicals which are formed as a result of chemical reaction are called products. What is meant by chemical reaction? The exchange, combustion or decomposition that occurs in the molecules of substances during a chemical change is called chemical reaction. It is the process by which one or more substances are arranged to form different substances. What is catalyst? Give an example of each of the negative and positive catalyst. A catalyst is a substance which changes the rate of a chemical reaction without taking part in chemical reaction itself. An example of negative catalyst is glycerin which decreases the rate of decomposition of hydrogen peroxide and manganese dioxide (MnO2) is an example of positive catalyst which increases the rate of decomposition of hydrogen peroxide. Write the names of different type of chemical reaction. The names of different type of chemical reaction are: i. Addition and combination reaction ii. Decomposition reaction iii. Displacement reaction iv. Acid-base or neutralization reaction. Write down any four factors that affect on chemical reaction. Solution or concentration of the solution. Which of the following information is conveyed by a chemical reaction? Which among the following is not a physical change?